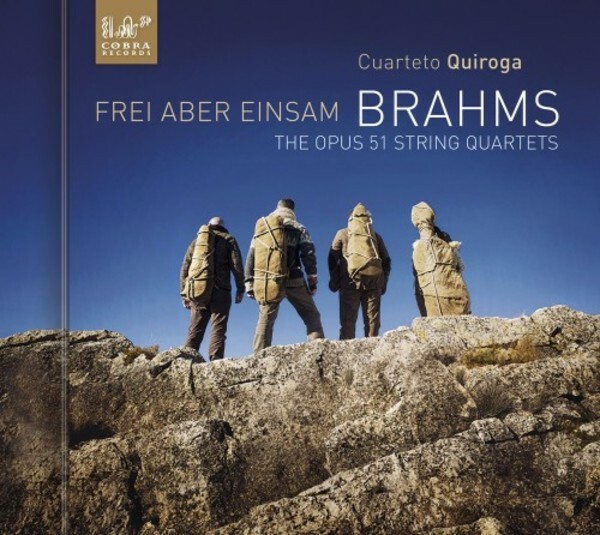 After their two succesful albums 'Statements' (COBRA0035) and '(R)evolutions' (COBRA0037), the prize winning Cuarteto Quiroga returns again with another innovative and bold recording: 'Frei aber einsam'. 'Frei aber Einsam' � �free but lonely� � was the motto Brahms shared with his good friend Joseph Joachim and it forms the motivic basis of all the movements of his second quartet: the first letter of each German word represents a musical note (F-A-E). The inherent melancholic character of this motto can often be found within his music. Brahms identified with it deeply, having fought virtually alone in defence of his work, his aesthetic conception and his chamber music. This wonderful recording is a testament to Brahms' beliefs.